Allow ourselves our favourite pair of flattering travel footwear no matter how chunky or heavy. Most importantly, above all else, the feet must not hurt at the end of the day. Our favourite pair of footwear will usually be comfortable enough to allow all-day wear even with that bit of heel. It should let us do a walking tour, all-day shopping and transition from day to night. If you don’t have them yet, go find them, get them immediately, break them in and practice walking in them until you find it easy to walk in them all day. More than one lean team member swears by this glorious smelling, volume guaranteed hair texturiser. Spending hours getting ready and achieving the perfect hair is not time well spent. Money can be earned but we cannot “claw back” precious holiday time. Travel hair is often not beautiful hair and long (ish) hair can be especially tricky to care for whilst traveling because it takes so long to wash AND to dry. Plus it needs a lot of work getting a “hairstyle” unless you are blessed with naturally voluminous beach tousled hair. Or, you are one of those that are skilled and look good with an effortless up-do. From outdoor adventurers to occasions where hair washing/styling is not convenient, this item is worth its weight in gold. They always smell fantastic, gives your hair lots of volume and texture. It allows you to reshape your hair with a few tousles with the fingers. It also allows you to have clean smelling and looking hair even with longer periods between washes. All that without the hassle of a full‐on wash, blow‐dries, and styling. Some of us can even off-set the weight as there is no need for any hairdryers or curlers (straighterners). To many, spending money on organisers seems frivolous. While it looks like adding more things to the packing, it actually buys you more space Marie Kondo style. As huge proponents of organised and modular packing, the lean team look to up one on organisers helping you unpack in a jiffy on arrival, by proposing not unpacking at all…with the right structured bag. 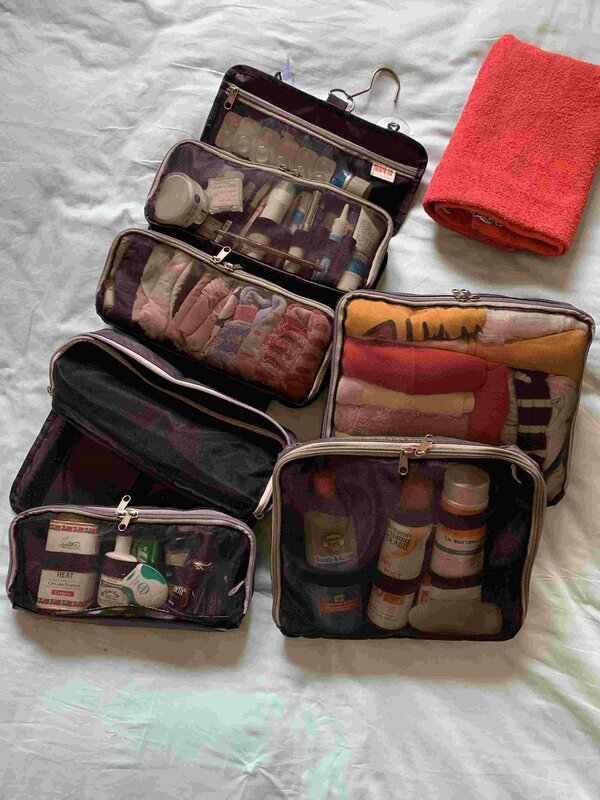 The HangPac is an extra large toiletries/accessories/make-up organiser case that, have space enough, to allow many small comforts of home away from home. One of the first things we do when we arrive at a destination is unpack and the last thing is to repack the toiletry bag. The HangPac eliminates this chore through the detachable pockets. Items can sit in their “homes” (pockets) comfortably throughout the duration of the trip. Hang the organiser up where you need it most and detach the pocket you need somewhere else. Whether we admit it or not, we are most likely to bring along more than our everyday wallet can hold. The lean team usually go through the motion of removing all unnecessary things like reward cards and extra bankcards etc. But the freed up space will usually not be enough for e.g. multiple currencies, tickets, hotel key cards to name a few and especially when travelling time is an extra important time to stay organised. A travel wallet will be required to be larger than normal wallets and roomy enough to carry everyday use plus all travel documents. As importantly as it being a practical item, it needs to be chic, luxurious and even better if you can double it up as a clutch for dressy events. The lean team understands and agree that travel style should focus on comfort and practicality but keep you looking stylish at the same time. There is no need to look like you’ve let yourself go and not made any effort at all just because you are on holiday. Sunglasses, as an accessory, is an effortless way to looking good without too much effort. Looking good make you feel good, confident and helps in those holiday photos and selfies. A good quality and stylish pair of well chosen sunglasses can be a high impact style item that instantly boosts any everyday look into a glamorous look. So, lift “nothing outfits” and reduce the need to spend too much time on hair & make-up, splash out in space and weight for a pair of sunglasses or two, why not three!